How to Log In as a Club Member For The First Time. Step 1: Click on the [Member] menu item. 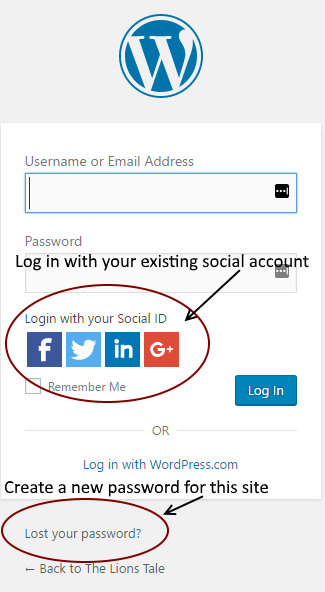 You can use an existing LinkedIn, Facebook, Twitter, or Google account –> IF <– it uses the same email address that appears on the Membership Roster. Your email address will connect you to your account on this website. Back at The Lions Tale, you should now see your name (and avatar, if available) above the upper right corner of the page. You can use this method to log in every time you visit this site. You can use the “Forgot Password” feature to create a new password and log into the existing Club Member Account already created for all club members. If you click the “Lost your password” link, you will be given a window to type in your email address. Type it in, and (if it matches your member account) you will be sent a link at that email address that will allow you to reset your password.You can use that new password to log into The Lions Tale. Once you have logged into The Lions Tale, you should now see your name above the upper right corner of the page.In the future, you can log in to this site with your user name (or email address) and the password you just set. You don’t need to click on “Lost your password” each time. Note: If you instead choose to create a new account, you will have to wait for it to be granted permission to access pages restricted to Club Members Only.